Fuji FinePix X100, originally uploaded by The Digital Story. 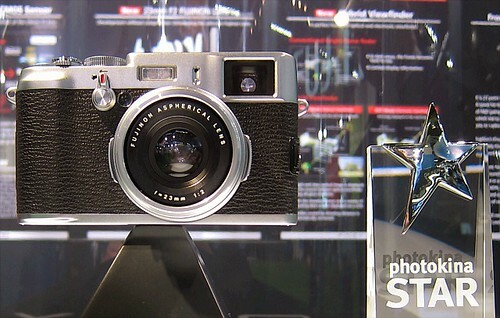 Awarded a photokina STAR award, the FinePix X100 reminds me of the finely machined cameras of the 1970s. The top level dials are all metal, the body is constructed of magnesium alloy, and the trim is leather. The camera features an APS-C CMOS sensor, 23mm (35mm equiv) f/2 Fujinon lens, and the hybrid viewfinder can switch from optical to EVF mode. Very innovative. Fuji reps said we should see the camera in the Spring of 2011, probably for a hair less than 1000 Euros. It's a beauty.